MNS – food production and distribution company – was founded in 1990 with the aim to bring genuine homemade cakes to the market. Cakes and pastry coming out of the manufacturing facility in Ravno Selo rightly deserve their name because they are made using traditional recipes, are free of additives and preservatives and prepared with cooked homemade creams. Like any true housewife who makes sure her kitchen is “spick and span”, we also make sure our confectionery is fully controlled. 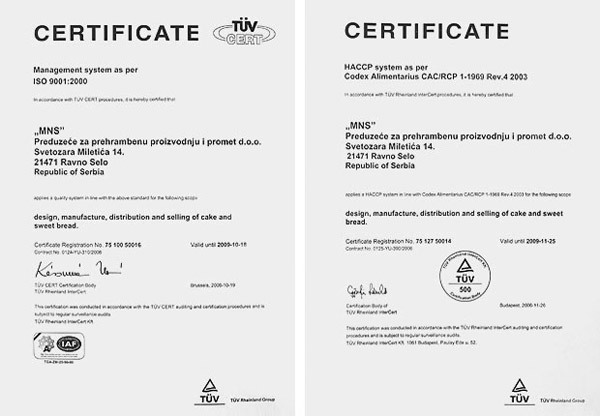 We have implemented ISO 9001:2000 system (which includes monitoring and recording of all raw materials and ensures the constant quality of the product), as well as HCCP standard (hazard analysis and critical control point) that guarantee the uppermost quality of our cakes. We have 50 employees working in two shifts, so that you, your families and friends can enjoy tasty homemade cakes and pastry. You just have to decide…We know that this is not easy, but alas sweet troubles!